North Hollywood Station’s new above-ground structures, as viewed from across Lankershim Boulevard last week. 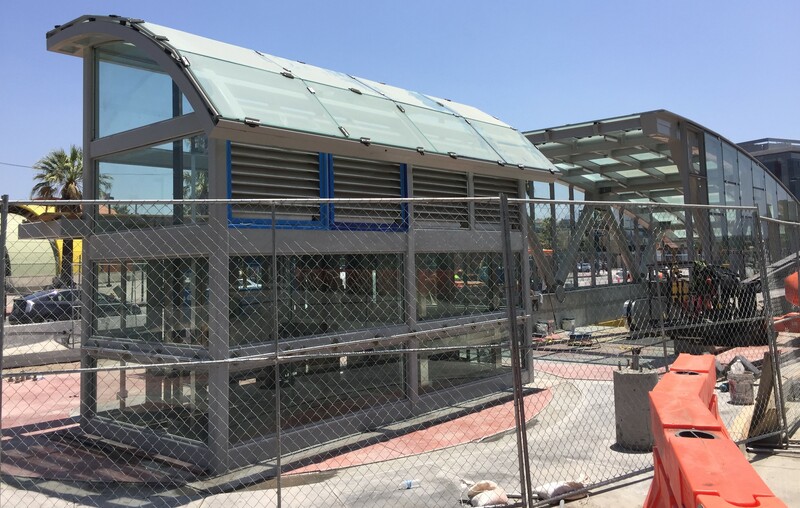 The new North Hollywood underpass is due to open this August. Photos by Joe Linton/Streetsblog L.A.
Metro’s new tunnel connecting North Hollywood’s Red Line and Orange Line stations is looking nearly complete. According to Metro spokesperson Dave Sotero, the project is anticipated to open next month. Per Metro [PDF] the tunnel will save riders approximately 44 seconds on transfers between the Red and Orange Lines. 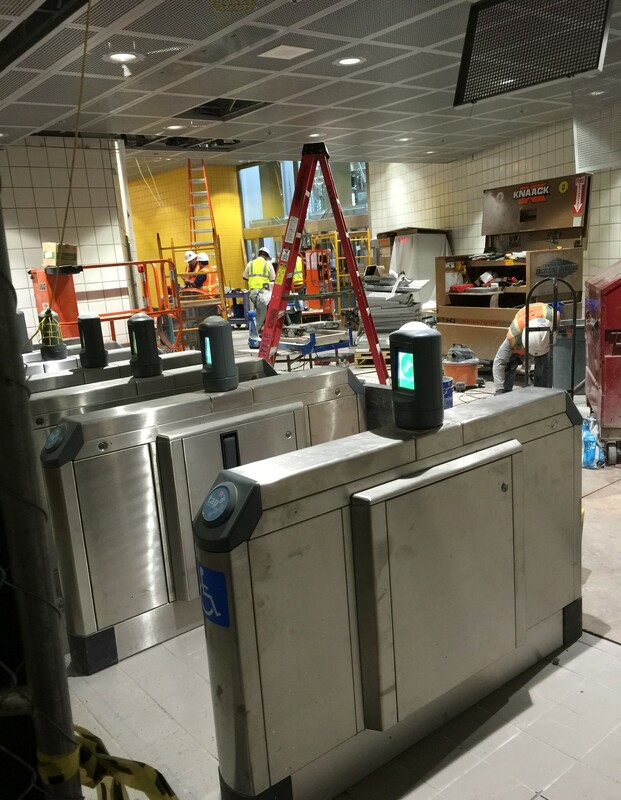 The Red Line station’s fare gates and fences have been reconfigured. The above-ground structures for the escalators and elevator seem nearly done. Riders who poke their heads around the construction fence can see that the tunnel itself, while still a construction site, appears almost ready for pedestrian traffic. 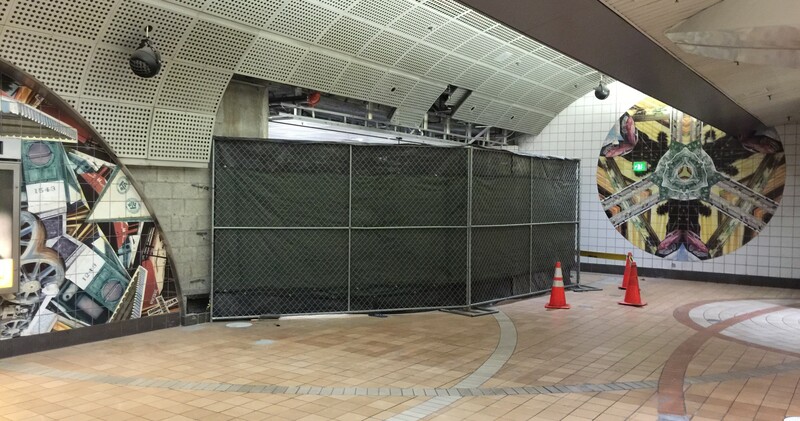 Adjacent to the Red Line North Hollywood Station platform elevator is a construction fence. Looking around the left end of the fence, one can view the new fare gates and the tunnel itself. See this December 2014 SBLA article for more North Hollywood tunnel specifics, including diagrams and maps. See also Metro’s project page – click on NoHo Underpass. This is going to lower the amount of time that it takes transit customers to move between the Orange Line and subway station. It will also greatly reduce the number the odds of someone running across the street in front of moving traffic to get to a Orange Line bus parked at the station. I wondered what would happen to the crosswalk on Lankershim Blvd at the Universal subway station when the pedestrian bridge was complete. It was eliminated. So now if you want to get to and from the bus station across from the subway on the east side of Lankershim Blvd you have to go up on the pedestrian bridge which goes diagonally across Lankershim Blvd and walk cross the entrance to Universal Studios. This makes it much, much less convenient and more time consuming to switch between these two transit stations. I am kinda split on this project. It’s going to save me time personally, but it is kinda sacrificing/degrading the street level (which people making bus-to-bus transfers will still use) to more car traffic. LA Times Christopher Hawthorne tweeted critically about it. There are better ways to spend $22M+ to improve NoHo mobility (like, say, adding something like 1,500+ bike share bikes), but I am looking forward to the tunnel being done and open, nonetheless. Granted, I don’t live up in the Valley anymore, so this is no longer my immediate problem. But it scared me to cross in the 200+ platoon along Lankership to reach the Orange Line when I did it almost every day. So, that’s what I’m focused on. You could add 1,500 bike share bikes but that wouldn’t have helped the transit riders crossing at that intersection–probably numbering over a million crossings for that transfer each year. Which demographic do you want to help? Sure, there is some comingling. But overwhelmingly, right now, bike share riders are more likely to be white and not low-income than those who are riding transit. They like to burn away all the bike/ped money on big fancy projects rather than say fix miles of sidewalks, install more cross walks, install protected bike lanes….